The new Queen’s Park Sports Centre in Chesterfield is the latest F T Leisure project to open its doors to the public. The complex includes a 25-metre, 8-lane competition pool, a 16.5 x 7 metre learner pool with moveable floor and children’s fun water features, including water cannons and sprays that are integrated into the stainless steel balustrading. The centre also boasts a café, an activity studio, an 80-station gym and two squash courts. F T Leisure provided the water treatment and filtration systems for the two pools. The filtration systems are traditional medium rate sand filtration combined with chlorine dosing, pH control, filter coagulation and UV sterilisation. 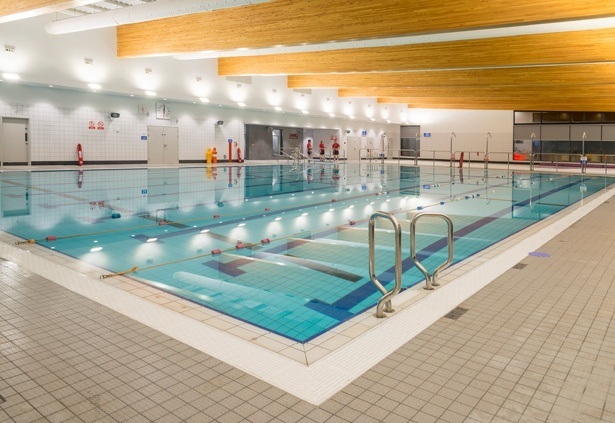 In the main pool, F T Leisure installed a motorised wall mounted pool cover system to retain heat as well as designing and installing an integrated hydraulic disabled access system. This will lower and raise bathers in and out of the water safely and discreetly enabling dignified, independent access for any swimmer who finds pool access difficult. F T Leisure has also designed a full parallel moveable floor system that maximises the functionality of the pool and the range of activities available for all level of bathers. The main contractor for the project was Morgan Sindall working with Darnton B3 Architects and the Sheerwater Consultancy. The £11.25 million project is being paid for by £6.725 million from Chesterfield Borough Council, £2.5 million from Chesterfield College, £2 million from Sport England and £25,000 from Squash England. Members of the public have chosen the design of a sculpture to go in the grounds of the new sports Centre. Jump, by West Midlands based artist Mick Thacker, is based on the concept of time lapse motion photography and shows the various stages of a person jumping through the air. The sculpture should be ready for installation during mid-December.